Does the app Email really require so many critical permissions of my mobile device? After I added an Exchange Mailbox account on my mobile phone, I got a 'Security update required' notification. Refer to the screenshot, please. My current system software is V8.0. I just wonder whether the app Email really requires so many critical permissions of my mobile device. Thanks for your advice in advance. 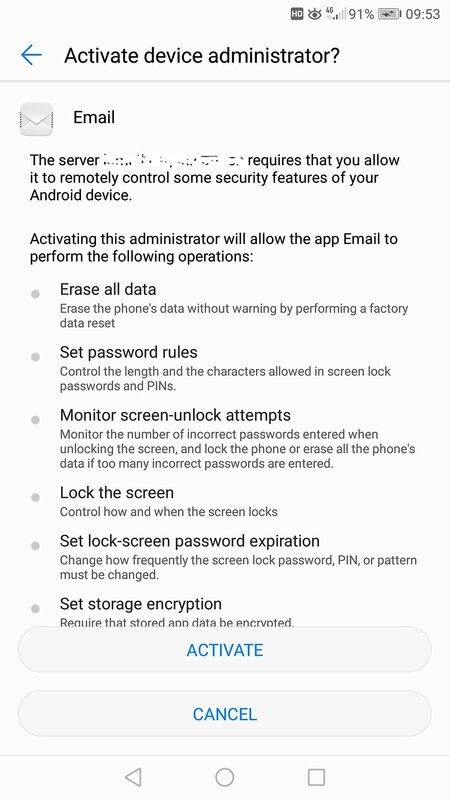 Do I have to activate the device administrator and grant so many permissions to the stock email app in order to succeed in syncing my mailbox? All those permission suggest security. In my opinion your email dosen't need those permission in order to sync properly! The answer to your question might be found with the manufacturer and why they are asking for those permissions! Every time I open my gmail app I get a message that says; there's a problem syncing this folder, that message is present for only a moment, then the app works just fine. I have reset the sync settings several times with no positive results. The only suggestion I can make is to contact the manufacturer and ask why they want those permissions. And you might find out that the reason may or may not be to your benefit .